Fire up and get cozy with the Sun Joe<sup></sup> Fire Joe 35-inch cast stone fire pit (model SJFP35-STN). Fire Joe is an ideal outdoor centrepiece for keeping family and friends warm and entertained outdoors when the temperatures start to drop. A stylish linear design sets the Napoleon Hamptons Rectangle Patioflame Table apart from the rest. The beachy outdoors feel of the lines, and driftwood colour match any dicor. Gather round and relax in front of the beautiful dancing flames. Safe and fuel efficient, the Hamptons Rectangle Patioflame Table features a thermocouple valve that cuts the gas when flame is interrupted, meaning that if a gust blows the flame out, or you forget to shut the gas when you're done, no gas will be wasted. The beautifully constructed, durable, aluminum surround conveniently hides a gas tank (propane models). Never worry about the weather, drainage holes in the burner pan allow the rain to drain away, and the optional windscreen will protect the flames from the wind. Set your drinks down, converse in comfort and enjoy your outdoor living space. Easily convert your Hamptons Patioflame Table into a fully functioning table with the included matching cover. Fire Joe 35-inch Cast Stone Fire Pit Fire up and get cozy with the Sun Joe<sup></sup> Fire Joe 35-inch cast stone fire pit (model SJFP35-STN). Fire Joe is an ideal outdoor centrepiece for keeping family and friends warm and entertained outdoors when the temperatures start to drop. 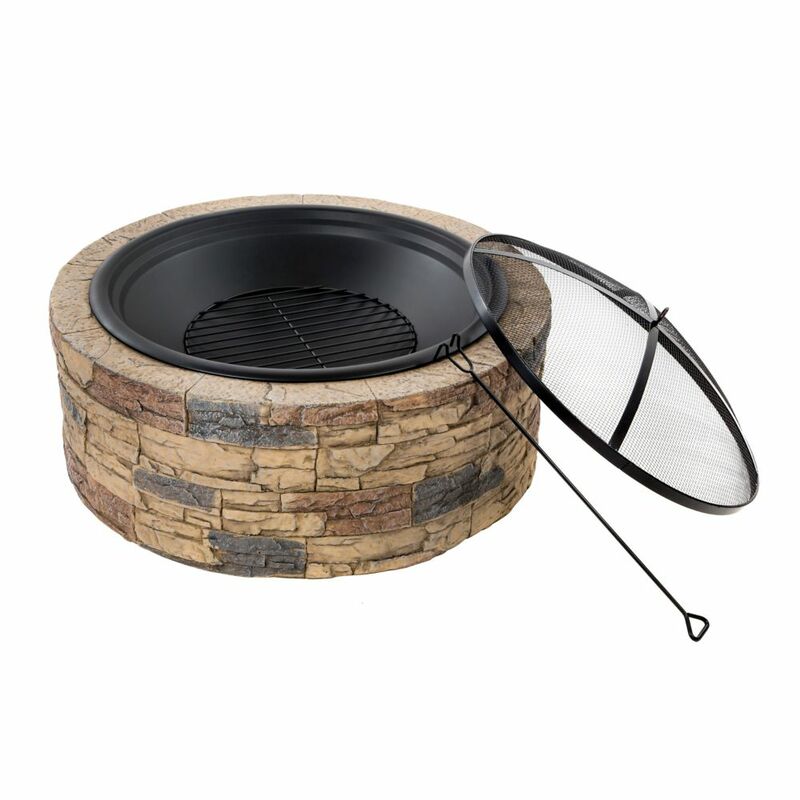 Fire Joe 35-inch Cast Stone Fire Pit is rated 4.4 out of 5 by 35. Rated 5 out of 5 by Merry from This firepit was exactly what I was looking for. It’s beautiful, strong and durable, so glad I ... This firepit was exactly what I was looking for. It’s beautiful, strong and durable, so glad I purchased it. Rated 4 out of 5 by coconut from This product is just what we were looking for and fits great with our flagstone. We were a little... This product is just what we were looking for and fits great with our flagstone. We were a little disappointed with the fit of the pan and the screen cover. We have had it for a few weeks and functions good. Rated 5 out of 5 by Drew from This fire pit looks great in my backyard. I placed... This fire pit looks great in my backyard. I placed large pavers underneath to keep it directly off the ground. It's much larger than I originally anticipated; but looks great! Well packaged & arrived without any damage. Would definitely recommend. Rated 5 out of 5 by flatlander from Pleasing appearance and functional!! Wife is a mild pyromaniac. Loves to watch wood burn and sit on the back patio and relax. This unit is better by far then the last unit we had. Larger fire bowl and better over all construction. The wife is very pleased, and loves the design. The clincher for me is that should anything wear out, there are replacement parts available so that she can keep using it. We are very pleased with our purchase and tell our friends about our find. Rated 5 out of 5 by Dennis from Very pleased with our Sun Joe fire pit! Only... Very pleased with our Sun Joe fire pit! Only took seconds to assemble. We’ve already enjoyed our first fire. Luv it! Rated 5 out of 5 by Rich from Good quality, and still lightweight.... Good quality, and still lightweight. Please advise, if the bowl can rust? Also, please advise, why BBQ coal can not be used withi this fire pit? Is this firepit recommended for a deck. The description states this product is natural gas. It doesn't look like it. Can you confirm? I would like to use this product on a wooden deck. So is there anything that I can place between the pit and the wood to prevent damage? Would a set of concrete slabs work? Can the bowl be taken out and wood placed in the middle to have a deep fire or does the wood have to be in the bowl to prevent damaging the fire pit? Can the fire pit be used for coal burning bbq purpose i.e. Hong Kong BBQ style? Can this be used in the city of Toronto? Are fire pits like this permitted? If so, where is the best place to put it in the yard?